Nothing too special this Monday, just our usual monthly check-in at the orthodontist (20 miles away in Issaquah) to which we generally take bikes and bus. But just to make it extra difficult this time, we brought Pixie the dog along, so I may as well record it here for posterity. For busing we use the Old Mamabike, a Bianchi Milano city bike with Bobike Junior kid seat (blog post with lots of photos here, and most of our multimodal trips to the dentist/orthodontist can be found here). The Old Mamabike doesn’t have a front basket for Pixie to ride in (and if I ever did put something on the front, it would be very small so it could still fit on the bus rack) so Pixie rode in the Timbuk2 Muttmover backpack. 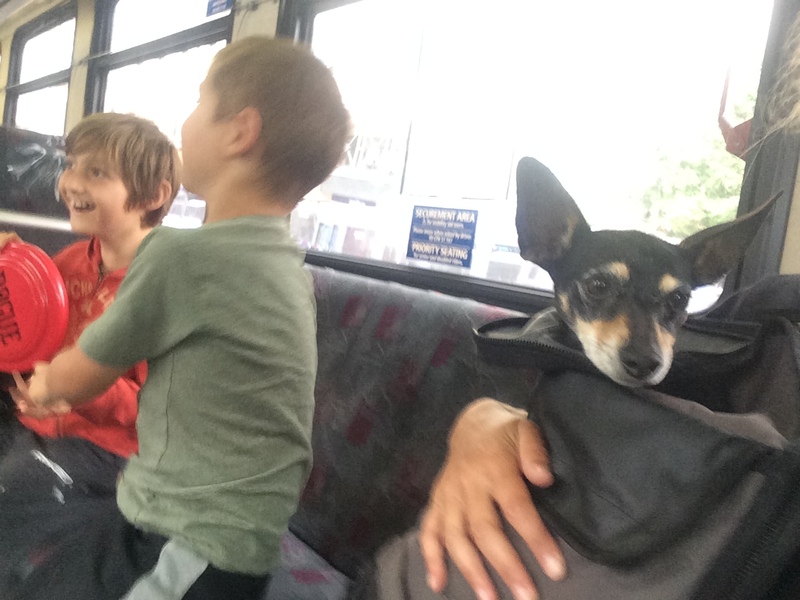 Dogs are allowed on Seattle buses, by the way. Dogs are not allowed inside the orthodontist so we took turns hanging outside with her. 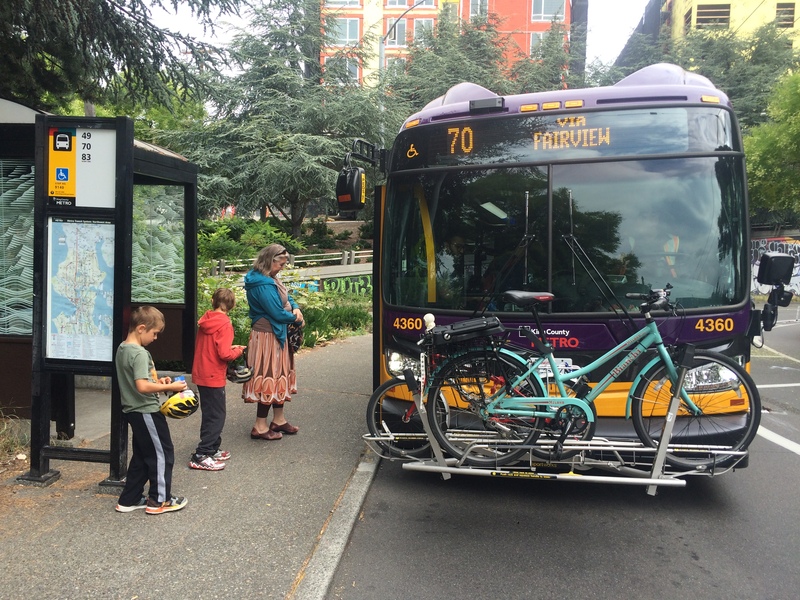 Our 10am bus had the new Sportworks Apex 3 transit bike rack! So much easier to use than the yellow claws. 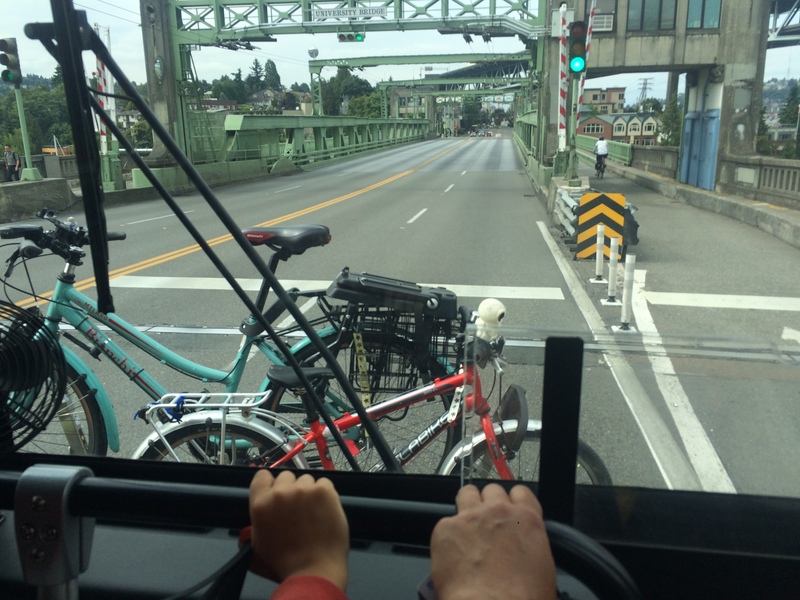 Having the bikes along isn’t critical on the Seattle side of things–we ride half a mile to the first bus and then a block between buses…but it is pretty fun to bike downtown with kids! 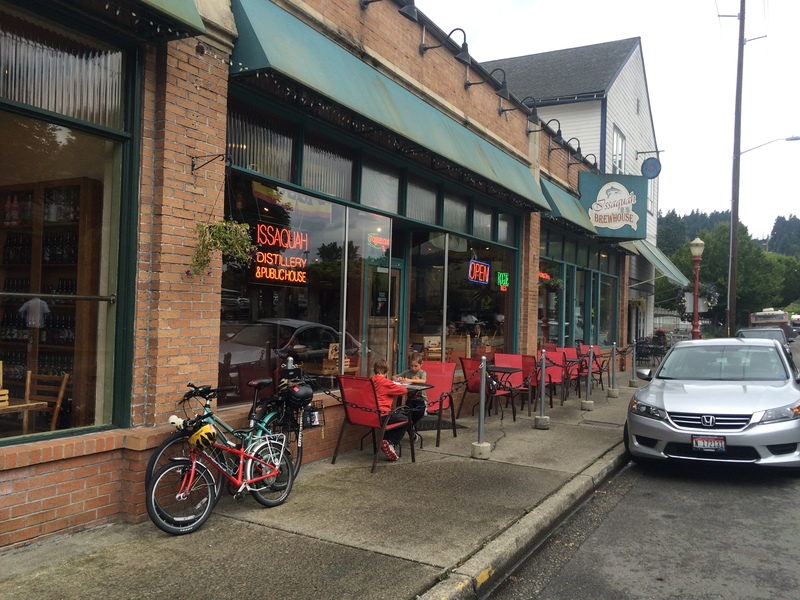 Once in Issaquah we ride a mile and a half to get to the orthodontist and then around to a variety of places in town. 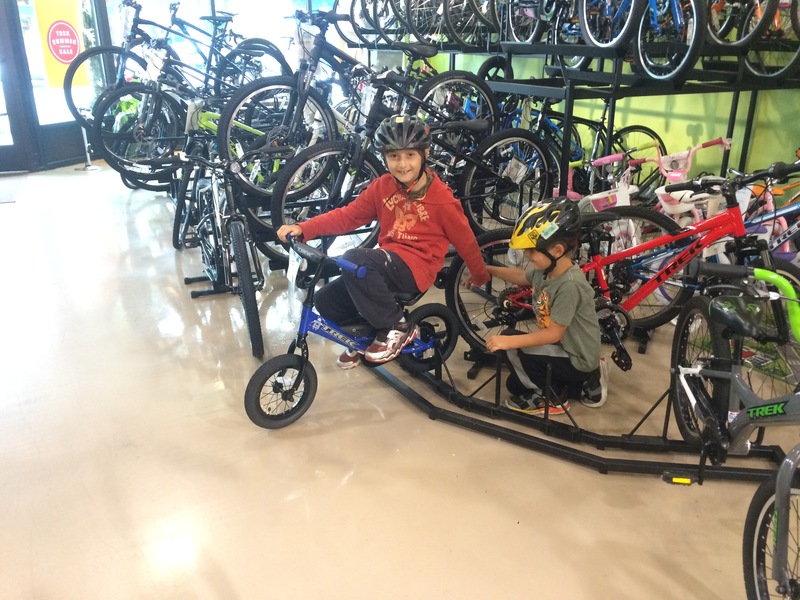 Today we used our bikes to visit Bicycle Center of Issaquah. Sadly, Dillon the dog wasn’t at work today so Pixie didn’t get to meet him, but they aired up my incredibly low tires (oops) and the kids fought over–I mean played with–the stationary kid bikes. 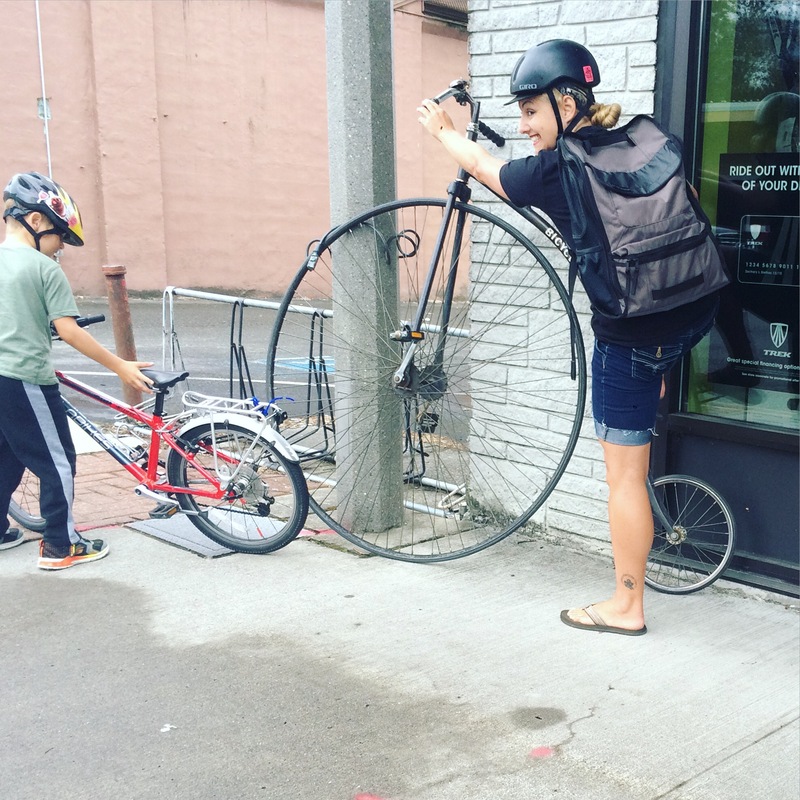 And we all pretended to mount the penny farthing. I haven’t worked on Pixie sticking her head (and just her head, not also half her torso) out the side window of the Muttmover yet so you’ll have to take my word that she’s chilling in the backpack. Then we pushed along to the Issaquah Brewhouse because they have a DOG MENU!!! Pixie ordered bacon and treats made from used hops. Other items on the doggie menu were peanut butter and jelly sandwich and cheeseburger. I assume those are the same as the human versions, but I didn’t ask. Her meal came on a frisbee, just like the kid meals. 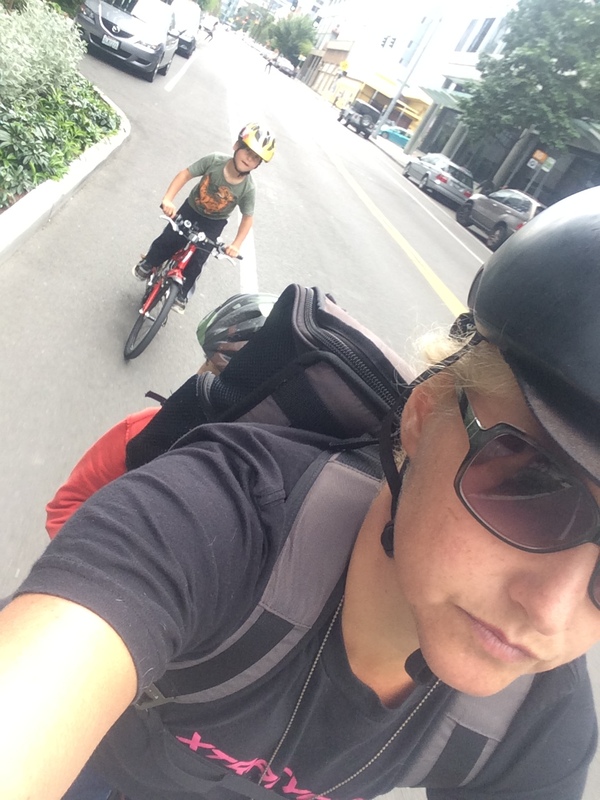 This trip was also different from those previous because I had my six-year old ride the separate bike and carried my nine-year old. I probably won’t do that again. 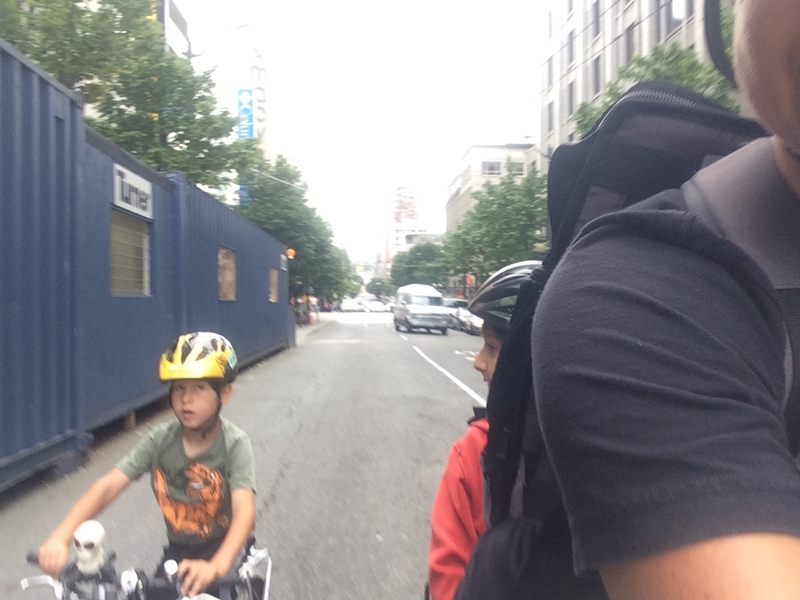 The little guy did fine on the way there, and was happy to ride the five miles home from Belltown, but things got a little messy at the end. We always take two buses on the way there and are 50/50 on taking two buses on the way home. It seems more worth it to have had the bikes along if we use them (duh), but it takes longer to ride the whole way home from the end of the 554 line. But it costs more and I have to lift the bikes on and off the bike rack an extra time. Hooray for having options, I guess! 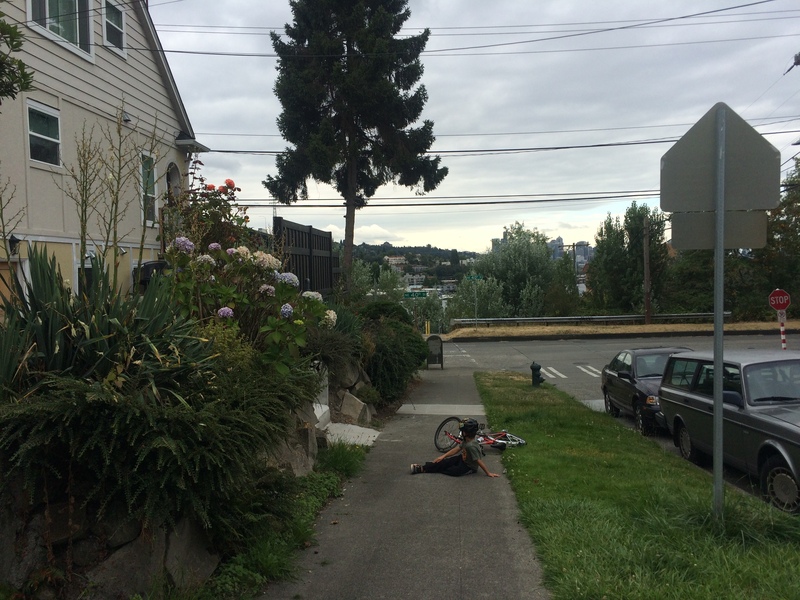 We started on the sidewalks (legal in Seattle), but moved to the street once I deemed it safe enough. 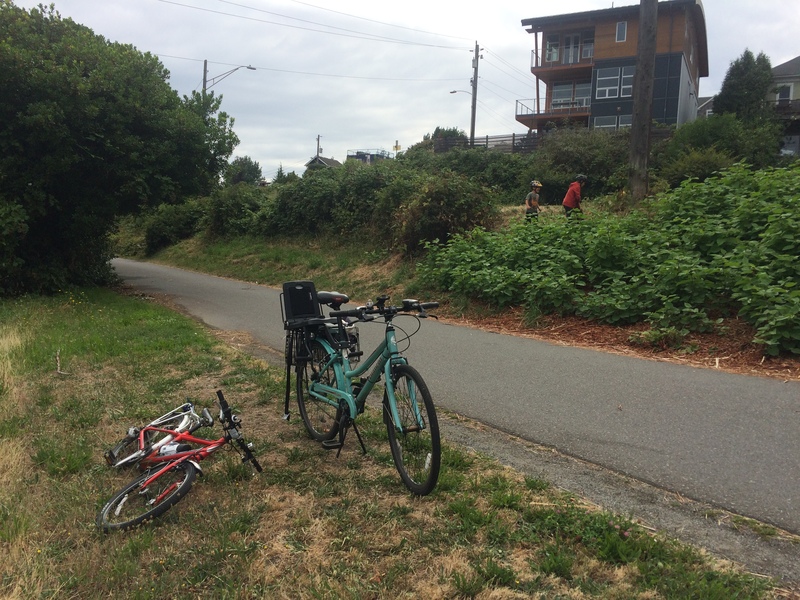 Part of that was in a door zone bike lane and I grimaced as my little wild child bunny hopped and skidded repeatedly behind me (thump…screech…thump…screech). I’m happy he has so much fun on his bike, but I instituted a new rule: NO BUNNY HOPPING OR SKIDDING IN DOOR ZONE BIKE LANES. I later added NO BUNNY HOPPING UPHILL as he swerved slightly while hopping his way ahead of me. The guy on the bike he swerved near laughed loudly at my hollering so I’m not sure that lesson stuck. Once on the Burke-Gilman Trail, my small racer zoomed ahead to hang with the faster commuters, generously waiting for me to catch up at intersections. And there was the obligatory blackberry-picking stop because now that it’s blackberry season, all trips take an extra half hour. All was good until that last hill when he decided he’d rather walk his bike than downshift (whereas my nine-year old still doesn’t seem to have the knack of shifting gears, my six-year old figured it out in five minutes, but thinks it’s better to mash uphill in gear seven rather than slowly–“Too slow!” glide up in first) and then he fell over and refused to move. I unloaded his big brother and was able to lure both kids into walking uphill by oohing and aahing at the sight of our school playground’s preliminary construction as I took turns getting both bikes up the hill. We have a bonus orthodontist visit in two weeks, but scheduled in the afternoon after bike camp, so it will be a different, even tired-er trip. Sure to be another adventure! ← The Pleasant Revolution Biketopia Music Festival special show at Gas Works Park!